Filigree jewelry has long been popular, with found samples in southern Asia dating to a few thousand years old and gold filigree flourishing in the Fatimid era of Egypt. Originally, filigree was made with delicate threads of precious metals being hand-manipulated by jewelers into intricate designs. This process took a lot of time and required expert craftsman. This made filigree jewelry very expensive. With the growth of industrialization in the late 19th and early 20th centuries, the production of filigree jewelry became faster and more inexpensive than ever. 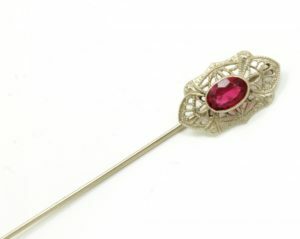 This led to an explosion in the manufacturing of In the 1920s, filigree jewelry was used to show off. The 1920s were a time of opulence; flagrant displays of wealth were not only common but encouraged. In the early twentieth century, many pieces of filigree were made through the use of die-cut stamps. Automation allowed intricate designs to be punched from solid sheets of metal. This decreased both the time and expertise needed to create astounding pieces of filigree jewelry. Stamped filigree jewelry is distinguishable from handcrafted pieces because the edges of the open spaces are sharper. They are closer to 90 degree corners, unlike the rounded edges of hand crafted filigree. The automation of the creation of filigree led to a huge number of filigree jewelry pieces being created. This increase in production was also due in part to the onset of the Art Deco movement. The geometric designs of filigree mirrored the abstract geometry of popular Art Deco design like that seen in the Chrysler building. 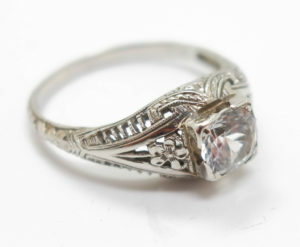 The most common metal used to create filigree jewelry in the 1920s was 18k white gold. It was soft enough to stamp with intricate designs but strong enough to hold the delicate designs. Additionally, the white gold color complemented the diamonds that were frequently added to the jewelry. Filigree was common in everything from rings to panel bracelets to necklaces. Filigree pieces retain their value not just because of the charming aesthetic appeal but also due to the continued fascination with the Art Deco designs and rising gold prices. Value for pieces can vary based on age, condition, maker, karat level, and the intricacy of the design. We at Mark Lawson Antiques love well-made filigree jewelry. If you have a piece you’d like to sell, call us at (528)-587-8787 or send an e-mail to marklawsonantiques@gmail.com to make an appointment at either our Saratoga or Colonie locations! Fatimid Jewelry, Metropolitan Museum of Art. A history of jewelry, especially filigree jewelry, in Fatimid Egypt. Art Deco Jewelry Appraisal, Antiques Roadshow, PBS. An appraisal of a stunning Art Deco necklace. Edwardian Filigree (a decade prior to Art Deco), Gemology Institute of America. A survey of Edwardian filigree jewelry at the turn of the century.